Yeah, that's probably what you might hear walking past the kindergarten or first grade classes in your building. Columbus discovered America. He traded resources with the Native Americans. Let's celebrate him for his perseverance, courageousness, and leadership. Ok, maybe not so much. There comes a point in education where educators should reveal what really happened when Columbus arrived to America. Teaching third grade, I felt as if this was the appropriate time to make the shift. I think the easiest way of introducing this topic to students is through the book, Encounter, by Jane Yolen. 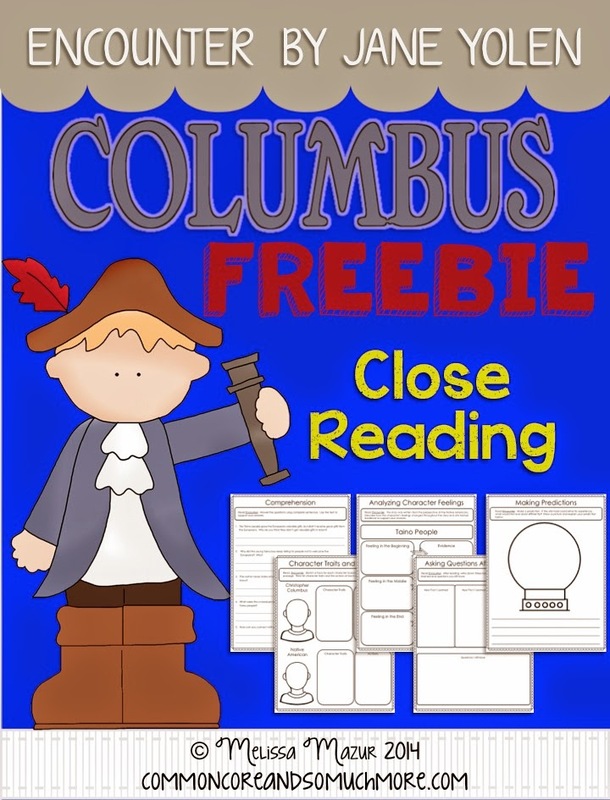 She does a phenomenal job using illustrations and evoking feelings to subtly shifting the reader's viewpoint on Columbus. What I especially love about this book is that it is written from the Native American's point of view, giving you a different persecutive of the events that took place. To assist you in the reading of this book, I created some graphic organizers and comprehension questions that you can download for FREE by clicking on the image below. There are also some amazing websites out there that you can project for your students, or have your students interact with on the computers. Hope this helps you plan for Columbus Day, which is soon approaching!